The little speaker that could. Here’s an impressively small speaker for impressively little money. It doesn’t deliver audiophile quality sound, but for a little speaker, it does what you’d expect for about half the price of its nearest competitors. If you listen to audiobooks or podcasts, this speaker is for you. Speech reproduction is very good. Music is a little constrained but that is to be expected from a unit this small. It weighs a mere 4.6 oz. (130g) and measures 3 x 3 x 2.5 inches (75 x 75 x 62.5mm). There are dozens of Bluetooth speakers available. Some are fussy to set up, and some have many features that can get in the way of simply playing music. 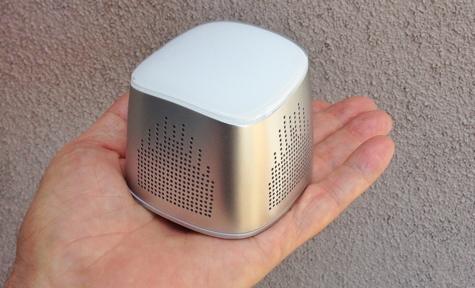 The Portable Bluetooth Speaker (it has no name other than this) is simple to use. As soon as you turn it on, it automatically goes into pairing mode. Open the Bluetooth setting on your iPhone and it immediately appears. From then on, as long as you don’t pair with another Bluetooth device, this unit is remembered by your phone. The built-in 500 mAh lithium battery charges with the included cable and will play for five to six hours on a single charge. The speaker includes a small mic on the back. If you are listening to audio from your iPhone and a call comes in, the music fades and you can answer the call. This solution can work for conference calls although the sound quality suffers if you are more than few feet from the mic. 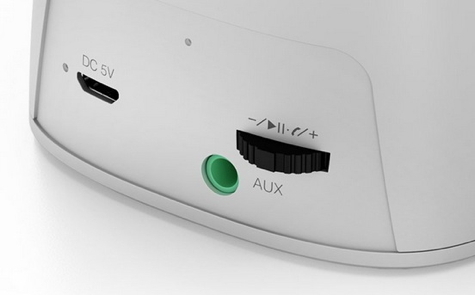 Inateck includes an Audio-in jack on the back of the speaker so that non-Bluetooth music sources can be plugged in. A 3.5mm cable is also included. The shoulders of the audio plugs are wide so that you must remove the case from your phone in order to seat the plug completely. The On/Off switch is on the bottom of the unit. On the back there is a small multi-function control that is a bit awkward. Pressing it performs the Play/Pause function. It is also pressed for answering the phone. Rocking the small control left and right increases and decreases the volume when a non-Bluetooth input is connected. One tiny control for all of these functions seems unnecessarily fussy. 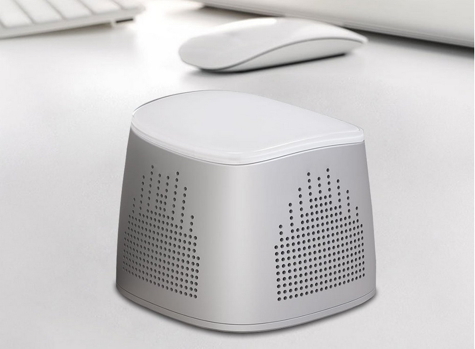 This Portable Bluetooth Speaker is nicely designed. It is available in black or white. The white version looks like a tall Magic Mouse and with its silvery sides, it complements the Apple esthetic. While the sound quality is pinched by the unit’s diminutive size, it is a good choice for an inexpensive take-along to the beach or campground. I find it perfect for listening to audiobooks or podcasts. Considering the small size, the MyMac Review rating is 8 out of 10.